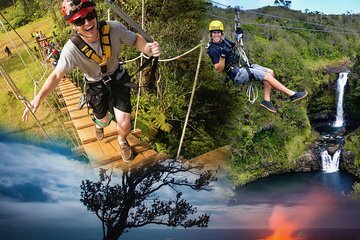 Highly Highly Highly recommend taking the Big Island Zipline Tour and Hawaii Volcanoes National Park tour!!! We just got back to the mainland two days ago, and I am delighted to rate this tour and company. We had a blast from the minute we were picked up to the minute we laid our heads back in the comfortable tour van to take a snooze after an adventurous, entertaining, and amazing day of zip lining and touring some of Hawaiis most exquisite sites. Our tour guide for most of the trip was Kent - we learned so much from his sharing his vast wealth of knowledge of Hawaiis history and lore! We would say that having Kent as our guide was one of the highlights for us! He is so personable, funny, and kind, too! The zip lining staff were exceptional, too! We were well instructed and made completely safe with all of their attentiveness, skill, and great equipment. It was a very fun zip lining experience, filled with beautiful sights! We visited a beautiful orchid shop in Hilo with another great tour guide, Jason. Some may think that wouldnt be anything special, but it was indeed. The array of orchids there is breathtaking! The trip to the Volcanoes National Park was sooooooo amazing - everything from walking through a lava tube, to sampling wonderful local wines, to seeing the lava activity from a safe distance and experiencing a blast of hot steam from a nearby volcano vent, to being enveloped under a brilliant expanse of stars in the darkness of the park - it was phenomenal! TAKE THIS TOUR - YOU WILL NEVER EVER REGRET SPENDING THE MONEY! I cant say enough about how perfect a day is was for us!!! Small group, personalised and instructors are very friendly and safety conscious. The zipline is very fun and the best part is towards the end as you over the waterfall. This was an awesome tour. Our guide was talkative and full of stories! It was a big day as we were staying in Kona but definitely worth the money. The zip lining was so much fun and very safe. The volcanoes were spectacular and dinner was delicious. We were suppose to be picked up at 6:15 and waited and waited. Finally got through to the tour office at 7:00 and were told the driver would be there within 15 minutes, it took 30. We later found out that the driver over slept, he should have told us that but didn't. We picked up other people, they weren't too happy about being late either. The zip lining was fantastic, the guys were great although we never got a chance to tip them and they deserved it. Our group of 4 felt rushed all day like they were trying to play catch up. Didn't eat lunch until 2 pm. It was a dry chicken sandwich but tasted good by that time. The lava beach was very cool, you need a wind breaker. All the places we stopped at were great - beach, lava tube, painted church, volcano crater museum but the day started off with a lie and we were rushed all day and got very tired of hearing apologizes from everyone. Zip lining was terrific and the staff were so well trainings and knowledgable, but also a lot of fun. Our volcano tour was ruined a little by poor weather, but our guide did her utmost to make sure we got to enjoy ourselves and see the most possible on a miserable afternoon. Best tour ever! I was terrified of the zipline part but the guides were so fantastic and comforting that I overcame my fear of heights along with flying through the air! We saw the volcano at sunset which was beautiful. All the meals were very good. The zipline guides were FABULOUS! They kept us laughing and made the tour much more fun! The landscape was beautiful and I loved that the zipline stopped us automatically. This was my first time on the zipline and I'll do it again because of these wonderful guides!!! The guide for the Volcanoe tour was wonderful too. She was very knowledgable and you can tell she loves this island. My husband asks lots of questions and she was very relaxed and didn't rush us at all. The weather was very foggy at the end but no one can control the weather! I would highly recommend both activities! !